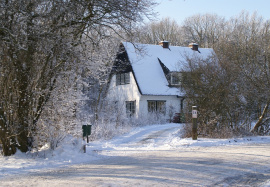 I often get asked whether it's a good idea to try selling in winter, and there is an argument for waiting until the Spring, but sometimes there are no options; you might simply have to sell. There is a counter argument for listing in winter anyway because some people also need to buy in winter, and there is usually less choice, so making yours stand out is a great way to attract good buyers. In my mind there are 5 simple things that you can do and, although most of these are applicable all year round, they are especially important in winter when wet, cold miserable weather can put-off the most determined buyer. You have to find a way of lifting their spirits as soon as they see your lovely home. Buyers these days don't register with the local Estate Agents and wait for brochures to be sent out. Instead they register with the portals (mainly Rightmove and Zoopla) and get sent emails when properties are listed. It goes without saying, therefore, that the house needs to be presented well in the photos. Find an agent who does professional photos (iPhone cameras are good but not that good! ), and who is prepared to spend time "staging" the property to make it look its best. Most good agents are happy to visit more than once to take advantage of the little sun we get in the winter and make sure that all rooms get a little sunshine through the window, for example, by taking photos at different times of the day. A good agent will also calculate the best time of day to take the external shots and visit around that time, to make sure that the first photo people see has a sunny and welcoming outlook. Make sure there is a floor plan and everything is ready before listing. Emails to buyers only go out once and you don't want to miss those first opportunities by listing the house before all the photos are ready. Get a good brochure made. Buyers like to see that sellers care enough about their house to pay for a good quality brochure. It suggests that they have looked after their house. Don't allow your agent to turn up with a hastily printed and crumpled A4 sheet. Good agents understand the value of a good brochure. When speaking with agents, find out what they are prepared to do to make your house stand out from the crowd. High street agents who are prepared to go the extra mile understand that selling in winter is about more than just listing and hoping - make them earn their commission! It is important to make the house as welcoming as possible for potential buyers. People don't tend to "window shop" in the winter so anyone actually taking the time to visit your home on a cold Saturday morning is probably serious about buying. Make them welcome. Don't bake bread or put the coffee machine on as people see through those tactics, but make sure the house is warm, all lights are on and it smells nice and neutral (vanilla candles are good). A good agent will arrive at least 15 minutes before the buyers to make sure everything is looking great to create the right first impression. I hope that's been helpful. Read Part 2 of the article here.